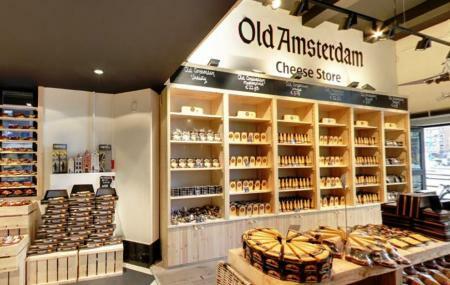 Find hotel near Old Amsterdam Cheese Stor ..
Old Amsterdam Cheese Store is a one of a kind attraction in the city and is a great destination to visit if you are looking for something different. The place is known and known well for its collection of exotic cheese and is available in many types and tastes. Visit the place and get to experience the true taste of Amsterdam. The place comes highly recommended by travellers and locals alike. Take a tram from Amsterdam, Dam/Paleisstraat. Take a bus from Amsterdam Centraal Railway Station. How popular is Old Amsterdam Cheese Store? People normally club together Bike Tour Amsterdam and Daalder while planning their visit to Old Amsterdam Cheese Store. I got some good souvenirs here. But I recommend you to buy cheese that is wrapped well because when I arrived Stockholm, cheese in the round box I bought had mold 😭😭 I guess because of humidity in the bag during I traveled (I had to traveled 5 more days after I bought this in Amsterdam). The staffs recommended me that I could save it outside refrigerator not over 14 days and then I have to keep in the coldness and eat before the expired date on the label. I came into the store I ask the employer what’s the best cheese, he took off his shoe and says this is whilst trying to make me smell he’s shoe. I just thought the guy was “High” but he was sorry afterwards, apology accepted the cheese was Horrible went to give it back and he said okay no problem chucks it in the bin. Was €5 but it wasn’t even worth it. When you walk in Amsterdam lively busy streets, it is very hard to miss the increasing number of Cheese stores and for a cheese lover like me it is a bless that's why it take me hours to go through the market! However the Old Amsterdam Cheese is still a hit as compared to other cheese. I will always try new things but old Amsterdam cheese will always be on my list. For Fellow Americans out there, try it with you next burger as a replacement to American and Cheddar.. and you will be blown away. A fun and interesting experience for what it is - a quick tourist tasting session - especially given its €20pp. The guy leading the session knew his stuff and was passionate about the subject matter. The selection of cheese and wines were good, and we learnt a bit about our favourite cheese.